This github project contains a Esri CityEngine model with ground plane, streets, parcels and 3D models of Berlin Mitte (2x2km) based on the open data provided by Berlin’s Senatsverwaltung für Stadtentwicklung und Wohnen (https://www.stadtentwicklung.berlin.de/). According to the copyright of the source data (see link above) you may use and modify this project as you like, but commercial use is prohibited. 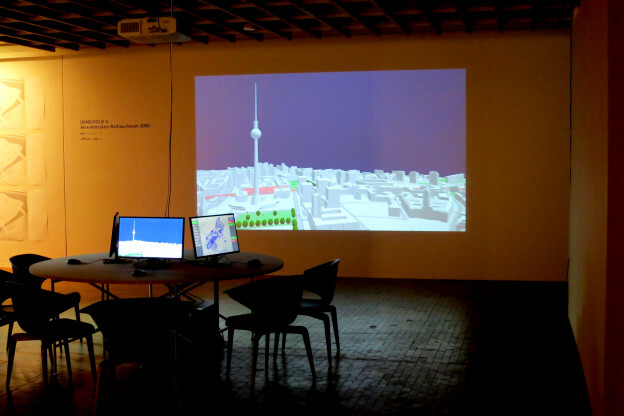 The CityEngine project was originally created for a participatory urban planning application “Enabling DEMO:POLIS”, exhibited at the Berlin Academy of Arts in 2016. The source code for the application is available freely as well (see https://robotized.arisona.ch/enabling-demopolis/ for more information). Compared to the source data, the 3D models in the CityEngine project have been cleaned up with great care (removing duplicate faces, fixing normals, merging vertices etc.). Thus, the model can easily be used for visualization, urban planning scenarios, etc. 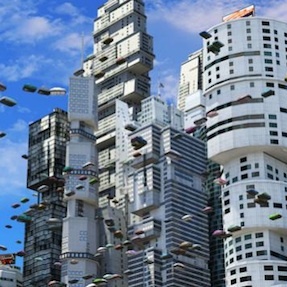 This entry was posted in Digital Art, Research, Software and tagged Architecture, CityEngine, Computer Graphics, Featured, Urban Modeling, Virtual Environment on May 24, 2018 by robot. Abstract: Various terrain visualization techniques based on geographic information system (GIS) data already exist. One major drawback of existing visualizations is that they do not capture seasonal variations well. Besides vegetation variations, in colder areas this particularly also applies to snow cover. In this paper, we propose a real-time multi-scale snow cover approximation and visualization for large terrains. The computation runs on a large grid, calculates the snow/water equivalent based on precipitation data from a GIS and snowmelt based on a physically-based solar radiation calculation combined with a degree-day snowmelt approach using level of detail (LOD). The snow visualization is divided into two parts: Zero thickness snow cover textures are generated for distant views. 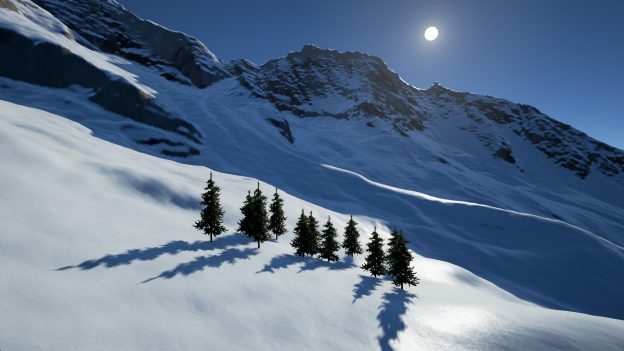 For close up views the terrain’s height field is modified using displacement maps and tessellation to produce thick snow covers. The GPU-based data-parallel computation and the visualization run on the GPU in real-time on a modern desktop computer. The implementation is tested using a real area in the Swiss Alps, with a size of 14.16 by 12.88 km, a grid resolution of 222 × 206, and a time step of 1 h. We compare the rendered results spanning several months with a time series of photographs from webcams for visual accuracy. 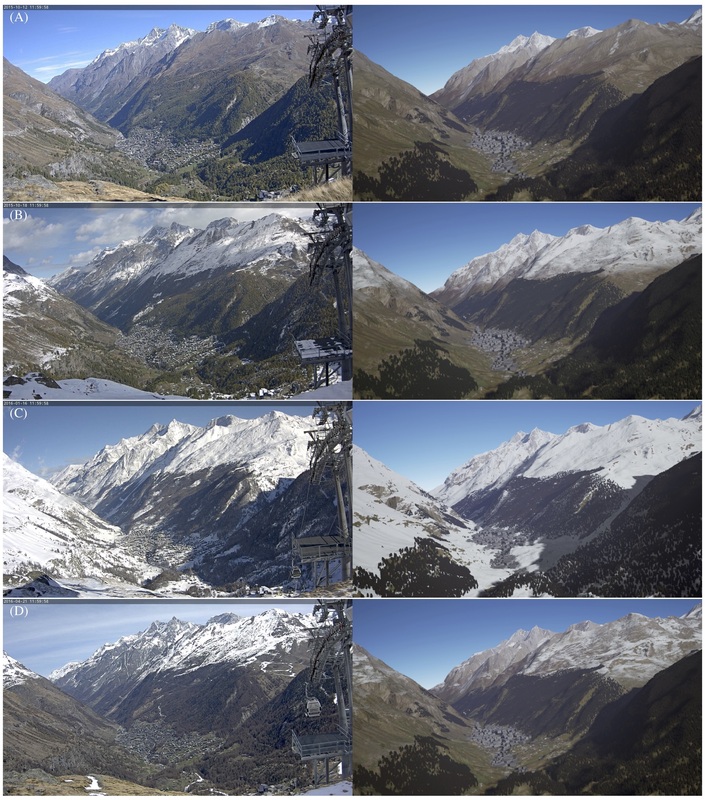 Comparison of webcam images (left) of Zermatt with our simulation (right). Trees were placed by hand and the sun position was approximated from the webcam image. (A) Start of the computation on 12.10.2015 with only the initial snow visible. (B) The results on 18.10.2015 after the first snowfall. The snowline was accurately computed. (C) The results on 16.01.2016 after the first heavy snowfall with the whole scene covered in snow. (D) The results on 21.04.2016 with snow beginning to melt as the temperature rises. This entry was posted in Publication, Research and tagged Benjamin Neukom, Computer Graphics, Featured, Simon Schubiger, Simulation, Unreal Engine, Visualization on February 2, 2018 by robot. 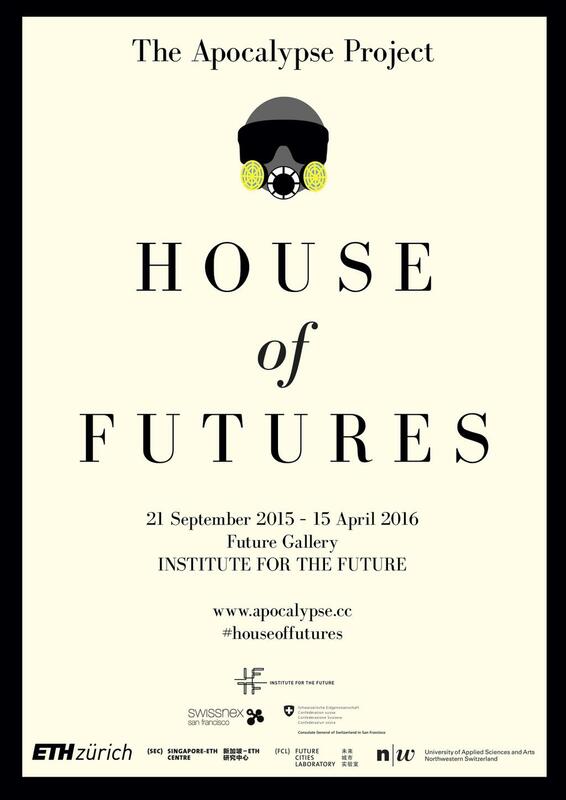 “Enabling DEMO:POLIS” is a participatory urban planning installation, presented as part of the DEMO:POLIS exhibition at the Berlin Akademie der Künste (http://www.adk.de/demopolis – 11.3.2016 – 29.5.2016). The installation engages the public in the design of open space and consists of six terminals that run a custom, interactive software application. The software leads the user through a number of typical urban design tools (space allocation, streets, buildings, landscape, etc.) and concludes with a fly-through through the generated 3D scenario, in this case, the Rathausforum / Alexanderplatz area in Berlin. The following video demonstrates a full cycle of a possible design. Support: Akademie der Künste Berlin, FHNW Switzerland (Institute of 4D Technologies), ETH Zürich (Future Cities Laboratory and Chair of Cognitive Science), Northumbria University (Architecture and Built Environment). The original 3D models were initially imported into Autodesk AutoCAD for layer selection and coordinate system adjustments, then imported into Autodesk Maya for data cleaning and corrections. In a final step the data was imported into Esri CityEngine for final data adjustments & cleaning, merging, labelling, etc. The data was then exported as OBJs. The software application is written in Java, based on the 3D graphics library/engine ether. As indicated above, all source code and data is available as open source. This entry was posted in Digital Art, Research, Software and tagged Architecture, CityEngine, Collaborative Environment, Digital Art Weeks, Featured, FHNW, Future Cities Laboratory, Installation, Portfolio, Urban Simulation, Visualization on April 3, 2016 by robot. The Wild Jewels explore the possibilities of data-driven wearable technology that responds to future environmental scenarios. The pieces make use of data provided by millions of sensors and mobile phones that permanently collect data of the momentary state of a city; and in addition expand the scale to include solar activity data collected from observatories and probes in space. The collection is inspired by large data analysis and collaboration facilities such as the Value Lab Asia, and it demonstrates typical modes of interaction with data: visualizing, filtering, projecting and connecting in a different context. Thereby, the pieces freely re-interpret and embody these modes, and bring them to a small, personal scale. The functional aspect is combined with precious materials and traditional jewelry and accessory designs, ultimately to be worn as pretty artworks. Raumwetter is a necklace that visualizes the beauty of space weather: The sun permanently releases streams of hot gas into space – the solar wind. A solar flare may blast millions of tons of matter into space, turning the wind into a storm reaching speeds of up to 2 million miles per hour. Luckily, on earth we are protected. Earth’s magnetic field redirects most charged solar particles to flow around the planet. However, space based technology (GPS), communication systems and power grids may be at risk. Thus, Raumwetter also has the capability to warn you of intense solar events. Raumwetter: Machine-cut acrylic; “patate di mare”; gold wire; transparent acrylic sphere, lit with pico-projector from inside. On Earth, 780 million people do not have access to clean water, and in the near future, availability of water is expected to decrease in many regions. Giftschleuse is a water filtering bangle that can be worn at all times. It provides instant, clean water. Similarly to an exo-skeleton, it is an exo-organ that provides additional functions to the human body in situations where our own organism cannot deal with conditions such as polluted water. In addition, it maps areas of clean water and shares the data with other water-seekers nearby. Giftschleuse: Machine cut brass, silicon pipes, coloured cooling liquid, electrical pumps. Besides correcting your seeing capabilities and protecting your eyes from strong light, Durchblick is a multifunctional display device that allows you to project the invisible into your visual perception: Depending on its configuration, it provides hints about wireless communication networks, radiation, dust and more. 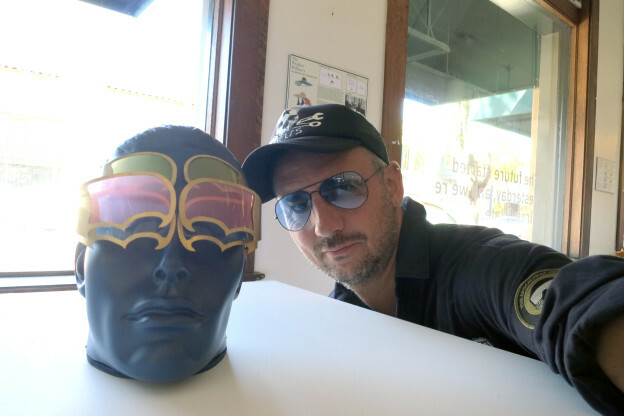 These are the shades for a hotter planet! 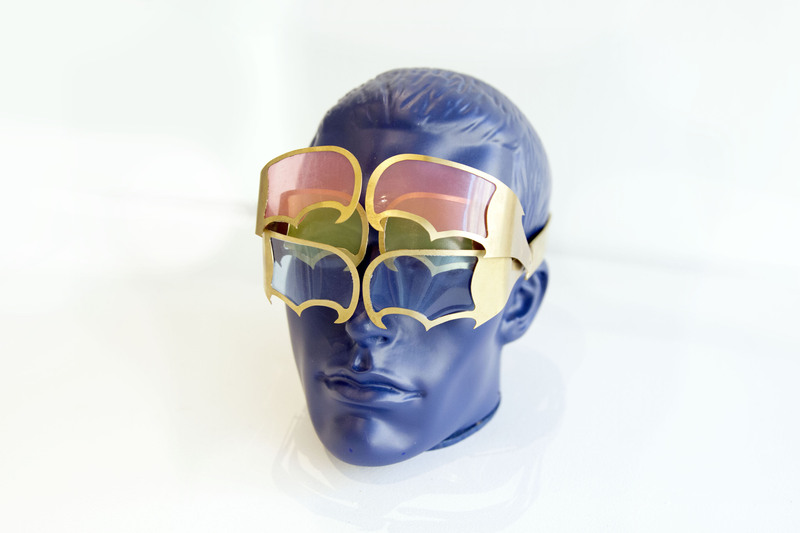 Durchblick: Machine-cut brass, acrylic glasses, motorised clock-work driving the shades. 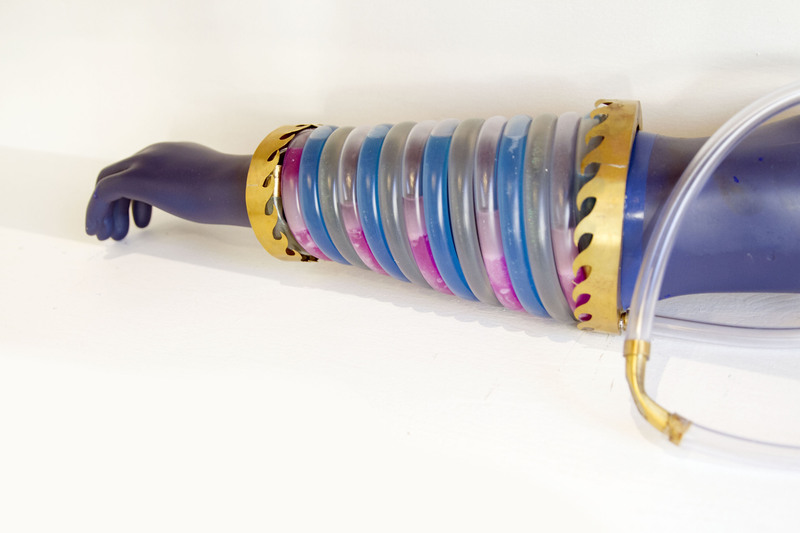 Übergesund is decorated glove and a social health device that builds spontaneous data networks with other wearers. It will inform you if somebody near you needs help, and it forwards such alerts to others around who might be able to help. In densely populated areas, such as in cities, Übergesund provides a decentralized health-network that allows for community-sourced services that are available at a high response time. Übergesund: Cut, turned and brushed steel; gold wire; silicon LED strings; custom-programmed smart watch LCD display. This work was supported by: ETH Zürich (ETH Global & Future Cities Laboratory), FHNW (Institute of 4D Technologies), Institute for the Future, swissnex San Francisco, Consulate General of Switzerland in San Francisco. This entry was posted in Digital Art, Research, Uncategorized and tagged Digital Art Weeks, DJ, ETH Zurich, Featured, FHNW, Future Cities Laboratory, Ika Arisona, Live Visuals, Portfolio, Simon Schubiger on February 2, 2016 by robot. Abstract: Origin-destination (OD) pattern is a highly useful means for transportation research since it summarizes urban dynamics and human mobility. However, existing visual analytics are insufficient for certain OD analytical tasks needed in transport research. For example, transport researchers are interested in path-related movements across congested roads, besides global patterns over the entire domain. Driven by this need, we propose waypoints-constrained OD visual analytics, a new approach for exploring path-related OD patterns in an urban transportation network. First, we use hashing-based query to support interactive filtering of trajectories through user-specified waypoints. Second, we elaborate a set of design principles and rules, and derive a novel unified visual representation called the waypoints-constrained OD view by carefully considering the OD flow presentation, the temporal variation, spatial layout and user interaction. Finally, we demonstrate the effectiveness of our interface with two case studies and expert interviews with five transportation experts. This entry was posted in Publication, Research and tagged ETH Zurich, FHNW, Portfolio, Visual Analytics, Visualization on December 2, 2015 by robot. Abstract: Identifying changes in the spatial structure of cities is a prerequisite for the development and vali- dation of adequate planning strategies. Nevertheless, current methods of measurement are becoming ever more challenged by the highly diverse and intertwined ways of how people actu- ally make use of urban space. Here, we propose a new quantitative measure for the centrality of locations, taking into account not only the numbers of people attracted to different locations, but also the diversity of the activities they are engaged in. This ‘centrality index’ allows for the identifi- cation of functional urban centres and for a systematic tracking of their relative importance over time, thus contributing to our understanding of polycentricity. We demonstrate the proposed index using travel survey data in Singapore for different years between 1997 and 2012. It is shown that, on the one hand, the city-state has been developing rapidly towards a polycentric urban form that compares rather closely with the official urban development plan. On the other hand, however, the downtown core has strongly gained in its importance, and this can be partly attrib- uted to the recent extension of the public transit system. 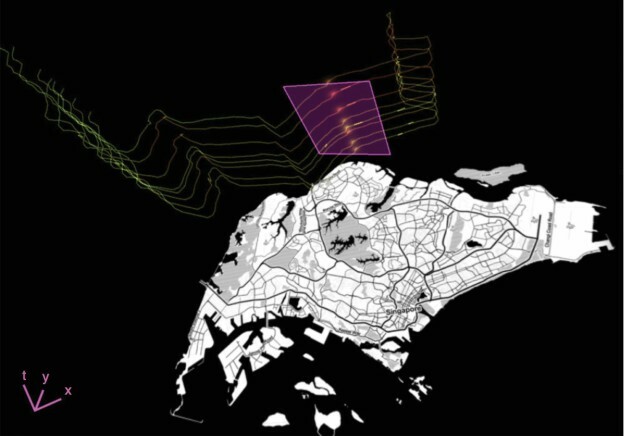 This entry was posted in Research and tagged ETH Zurich, Featured, FHNW, Future Cities Laboratory, Portfolio, Urban Modeling, Visual Analytics, Visualization on October 21, 2015 by robot. This entry was posted in Research, Software and tagged Architecture, CityEngine, Featured on October 19, 2015 by robot. Abstract: The availability of large amounts of mobility data has stimulated the research in discovering patterns and understanding regularities. Comparatively, less attention has been paid to the study of variability, which, however, has been argued as equally important as regularities, since variability identifies diversity. In a transport network, variability exists from person to person, from place to place, and from day to day. In this paper, we present a set of measuring of variability at individual and aggregated levels using multi-day smart-card data. Statistical analysis, correlation matrix and network-based clustering methods are applied and potential use of measured results for urban applications are also discussed. We take Singapore as a case study and use one-week smart-card data for analysis. 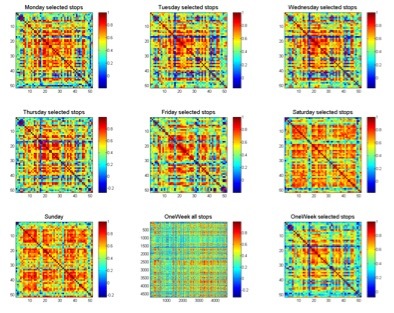 An interesting finding is that though the number of trips and mobility patterns varies from day to day, the overall spatial structure of urban movement always remains the same throughout a week. 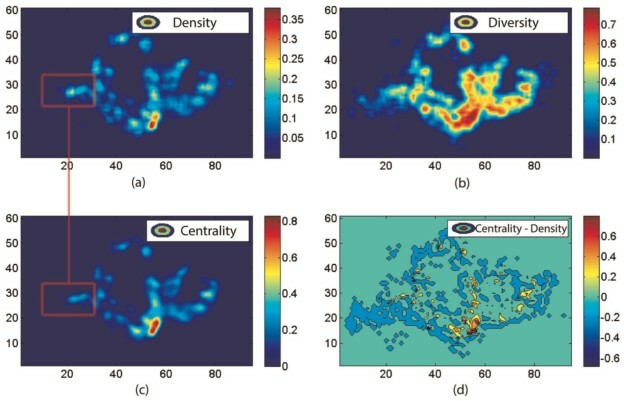 This finding showed that a systemic framework with well-organized analytical methods is indeed, necessary for extracting variability that may change at different levels and consequently for uncovering different aspects of dynamics, namely transit, social and urban dynamics. We consider this paper as a tentative work toward such generic framework for measuring variability and it can be used as a reference for other research work in such a direction. This entry was posted in Research and tagged ETH Zurich, FHNW, Future Cities Laboratory, Portfolio, Urban Modeling, Visual Analytics, Visualization on April 3, 2015 by robot. Journal: Transportation Research Record: Journal of the Transportation Research Board. Abstract: Widely used in the design and analysis of transportation systems, time-space diagrams were developed in an era of data scarcity, when it was necessary to obtain data by means of driver logs, human observ- ers, and aerial photographs. 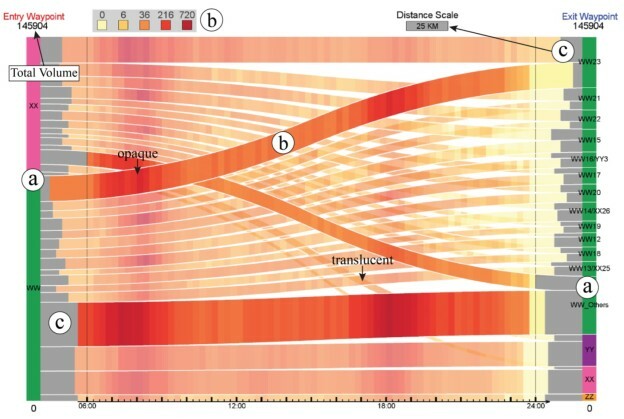 This paper shows how time-space diagrams remain relevant today, in an era of data abundance. An application efficiently encodes the trajectories of bus GPS data in a time-space cube and uses simple geometric methods to calculate and to visualize the headways and separation of buses on a bus route. These methods are discussed in detail. How they can be used as the basis of a software package that monitors performance measures for a variety of applications is explored. This entry was posted in Publication, Research, Software and tagged ETH Zurich, FHNW, Future Cities Laboratory, Portfolio, Space-Time Diagram, Visual Analytics, Visualization on January 21, 2015 by robot. Journal: IEEE Transactions on Visualization and Computer Graphics (TVCG). Conference: IEEE Visual Analytics Science and Technology (VAST) 2014. Abstract: Public transportation systems (PTSs) play an important role in modern cities, providing shared/massive transportation services that are essential for the general public. However, due to their increasing complexity, designing effective methods to visualize and explore PTS is highly challenging. Most existing techniques employ network visualization methods and focus on showing the network topology across stops while ignoring various mobility-related factors such as riding time, transfer time, waiting time, and round-the-clock patterns. This work aims to visualize and explore passenger mobility in a PTS with a family of analytical tasks based on inputs from transportation researchers. After exploring different design alternatives, we come up with an integrated solution with three visualization modules: isochrone map view for geographical information, isotime flow map view for effective temporal information comparison and manipulation, and OD-pair journey view for detailed visual analysis of mobility factors along routes between specific origin-destination pairs. The isotime flow map linearizes a flow map into a parallel isoline representation, maximizing the visualization of mobility information along the horizontal time axis while presenting clear and smooth pathways from origin to destinations. Moreover, we devise several interactive visual query methods for users to easily explore the dynamics of PTS mobility over space and time. Lastly, we also construct a PTS mobility model from millions of real passenger trajectories, and evaluate our visualization techniques with assorted case studies with the transportation researchers. This entry was posted in Publication, Research, Software and tagged ETH Zurich, Featured, Future Cities Laboratory, Portfolio, Transportation, TVCG, Visual Analytics, Visualization on July 15, 2014 by robot.